I’m a little bit behind on my Movember challenge, but the important thing is to not give up, so let’s play catch-up. Let’s first create some awareness. I have way to many awesome men in my life that I want to be around when I grow old. Sign up to raise funds and awareness for all the dads, brothers, sons and friends in your life. Together we can make a difference for men’s health – in prostate cancer, testicular cancer, mental health and suicide prevention. 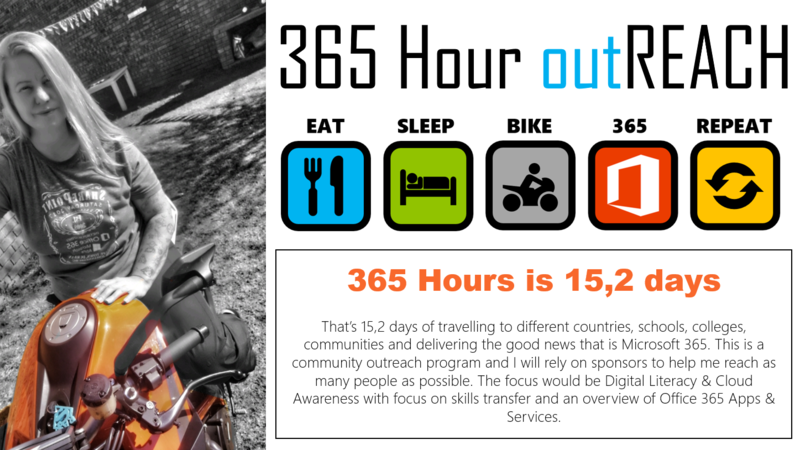 Click here to learn more or register (ZA link, should reroute to your region). After my session I met a lady by the name of Karin Synnøve Løkke and was pretty inspired by her ‘story’ (I’m trying to convince her to tell it soon). Anyway, in my session I explained that I was rather ‘aggressive’ about what I do and my passion to help people. I spoke about values and self esteem, and how we’re so much more than just the jobs we do. I also begged everyone to have more empathy with others, we all just need a little TLC you know…. The Viking Laws are the perfect framework for good user adoption, project and change management. Why on earth do we run around grabbing at models and methodologies when we have perfectly good ‘laws lying around’ which are even better to follow? 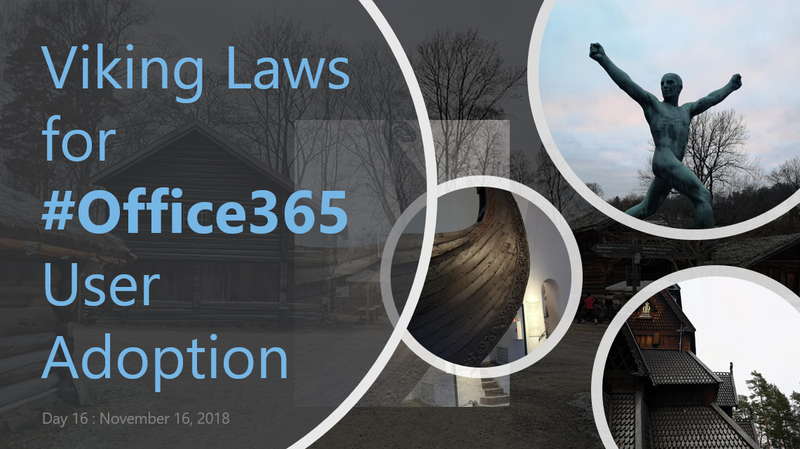 Below you’ll see these laws as well as my notes on how I would apply those in everyday #Microsoft #Office365 life. My notes: Be honest, take chances, communicate your failures and successes, don’t keep technology back because you’re scared something will go wrong. Fail fast, fail often. Try not to micro-manage everything, yes, I struggle with that. But when we get stuck in the detail, we very seldom achieve a lot. Know your products and use them well. My notes: Stay up to date with latest releases and new features, train your users, start a mentoring program to keep people up to date and continuously share the features and updates. Define measurements and success criteria (or you’ll never know if you succeeded.). Find your evangelists, setup forums with leaders to guide and help. My notes: These are good tips for Microsoft partners, but also for the internal customer relationship between IT and Business. I don’t think I have to explain how important honesty, transparency and fairness / decency is to me. My notes: Just because we’ve gone all Agile and Cloud, doesn’t mean you don’t need your ‘paperwork’ anymore. I still build portals with product pages which supplies the business and IT governance as well as training and other resources. Remember that we’re supposed to be happy, if you’re unhappy at work, you’re doing it wrong. Also remember you create your own happiness so don’t wait for someone else. Keep your end users in the loop, and make sure they’re fully equipped to use #Office365. Never forget that the best suggestions normally comes from business / end user side as they deal with the painful stuff every day. I do think I’m going to add the Viking Laws to my business proposals. My values have always been most important to me in work, and this is a great way to confirm that. Thanks for sharing this with me Karin. Image credits: Photos I took on my walkabout in Oslo, Norway. Made beautiful using Design Ideas in #PowerPoint. I’ll be speaking at The European SharePoint, Office 365 & Azure Conference in Copenhagen, 26 – 29th of November. #ESPC18 @EuropeanSP Also honored to be a community reporter at the event. Hoping to see you there!